Celebrate your success and contribution to our world with other like minded business women on International Women's Day. Topic: "Money, Mindset and Manifesting". Enjoy dynamic speakers who will assist you to not only receive "Aha moments" but will show you how to actually transform through these breakthroughs to transform into the real you! 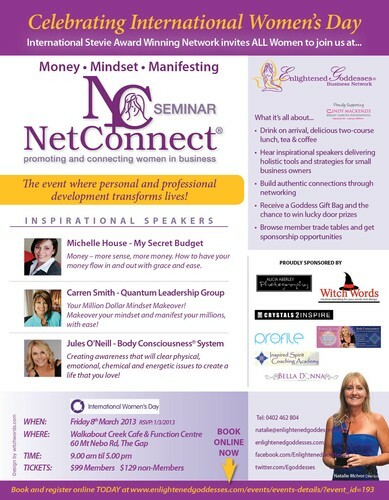 The NetConnect seminars offer an amazing opportunity to connect with other women and to enjoy the contribution that others are willing to offer. 1. Carren Smith- Qantum Leadership Group- Creator of life changing programs " The Art of Public Speaking", Mindset Makeover, Mindset Mastery, Speakers Secrets,Speakers Fast Trak and Sales Mastery". Survivor of the Bali Bombings, Carren is inspired to be a world leader supporting manking to create conscious change in their lives and our world. 2. Jules O'Neill- Founder Womens Wisdom and Body Consciousness has created a set of tools, techniques and systems that will clear past patterns and programs that are blocking you from achieving all that you desire. When you create new patterns you can create shifts, and move forward to be who you choose to be and who you truly are! Jules will be hosting a live session to clear our patterns and programs. 3. Michelle House- My Secret Budget- Seen on all the major TV channels and in many leading print magazines, Michelle is an expert on how to save more, budget better, have fun with your money and make sure you have more of it! Michelle will share all her tips and her secret weapons with us. You will enjoy a day of transformation, receiving, contribution, pampering, gifts,prizes, yummy food, and incredible new friendships. Browse our mini trade expo and enjoy free pamper sessions all day! - Mini expo with heaps of gorgeous products and services. - Yummy lunch, tea and coffee, drink on arrival, gift bag. - Lucky door prizes, pamper sessions. These seminars book out early so please book your ticket online ASAP.